Coastal Metals Ltd. began operations in 1995 and has expanded steadily in size to the present date and is proud to have a privately owned modern fabrication shop, complete with office facilities to house technical and administrative staff. Our (primary) plant is conveniently located just off of highway 11 which is one of the main arteries through New Brunswick and we are only a few minutes away from a local rail siding and the Port of Belledune. We offer to our customers the combined efforts of our highly skilled production and technical staff who are devoted to safety, quality, and customer satisfaction. By having ready access to a broad and reliable supplier network, and by keeping many aspects of the fabrication process in-house, we can deliver impressive turnarounds on projects involving thousands of tons of steel. Coastal Metals Ltd. wants to be on your team the next time you have a need for out-sourced fabrication. We will gladly discuss your upcoming projects for complete supply, or supply of select portions of large scale or small scale projects. We will work with you to deliver projects in phases while staying in tune with your erectors to help your project stay on track. 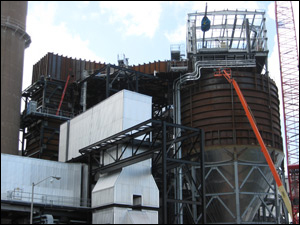 We have extensive experience in the fabrication of pollution control equipment for the power generation sector. We use the latest technology in our welding procedures and keep qualified personnel to ensure quality workmanship. 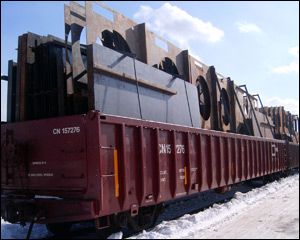 Coastal Metals Ltd. has industry standard blasting and painting capabilities as well. Within the Coastal Metals Ltd. paint shop, the paint staff can handle the toughest of paint systems. We can readily ship anywhere in North America while delivery outside of North America can be easily coordinated via the nearby Port of Belledune. From concept to completion, Coastal Metals Ltd. provides a full range of services that are designed to aid clients in achieving their fabrication objectives. CML's experience and resources maintain the ability to work from customer furnished ideas, design drawings or from in house designs and plans through consultation with the client. Coastal Metals Ltd. also maintains an internal quality verification system, approved by both the Canadian Welding Bureau (CWB) and the American Institute of Steel Construction (AISC). The management of Coastal Metals Ltd. is committed to the highest Quality Standards and our quality verification system, coupled with the requirements inherent to AISC and CWB certification (AWS-D1.1 & D1.2 compliant), provides us with control mechanisms which ensure the output of high quality products. Customer satisfaction is never compromised!